"I tell you the truth, unless you turn from your sins and become like little children, you will never get into the Kingdom of Heaven. About that time the disciples came to Jesus and asked, "Who is greatest in the Kingdom of Heaven?" Jesus called a little child to him and put the child among them. 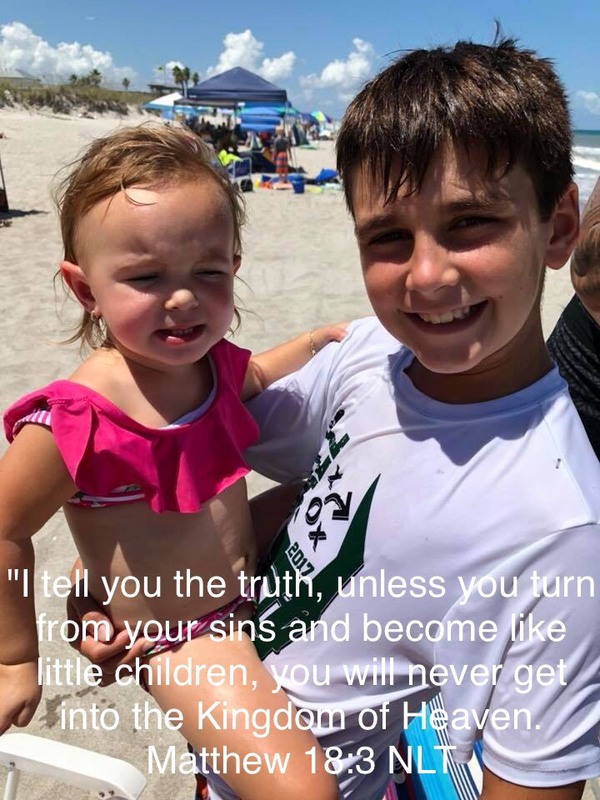 Then he said, "I tell you the truth, unless you turn from your sins and become like little children, you will never get into the Kingdom of Heaven. So anyone who becomes as humble as this little child is the greatest in the Kingdom of Heaven. "And anyone who welcomes a little child like this on my behalf is welcoming me. But if you cause one of these little ones who trusts in me to fall into sin, it would be better for you to have a large millstone tied around your neck and be drowned in the depths of the sea. "What sorrow awaits the world, because it tempts people to sin. Temptations are inevitable, but what sorrow awaits the person who does the tempting. So if your hand or foot causes you to sin, cut it off and throw it away. It’s better to enter eternal life with only one hand or one foot than to be thrown into eternal fire with both of your hands and feet. And if your eye causes you to sin, gouge it out and throw it away. It’s better to enter eternal life with only one eye than to have two eyes and be thrown into the fire of hell. [10-11] "Beware that you don’t look down on any of these little ones. For I tell you that in heaven their angels are always in the presence of my heavenly Father. This entry was posted on August 8, 2018 at 6:34 pm and is filed under One Walk. You can follow any responses to this entry through the RSS 2.0 feed. You can leave a response, or trackback from your own site.